If Super Bowl 50 is really Peyton Manning's last professional game, he's going to leave behind a game that has been irreversibly changed by his career. That's not a commentary on his legacy in terms of his statistics or success, although those are wildly valuable. And it's not a talking point about the actual physical style with which he played quarterback, although Peyton can count Russell Wilson, Andrew Luck and Marcus Mariota among the future NFL quarterbacks who attended the Manning Passing Academy. And it's not even about Manning's ubiquitous presence as a pitchman, how he somehow transitioned to becoming the Dad Joke Michael Jordan. More than anything, if Manning does leave after Sunday, he'll have made his mark by the simple fact that the game itself looks and operates far more like Peyton Manning playing quarterback than it did before he arrived. The act of how the sport is played in the National Football League is fundamentally different today from the way it was in 1998. Our baselines for success and expectations of how teams will play are informed differently. And in many ways, those changes mirror the style of Peyton Manning and the teams on which he played. That starts with the NFL's continuing offensive transition into a pass-first, pass-second, run-if-you-must endeavor. When Manning entered the league, the defending champions were the Denver Broncos, who had handed the ball to Terrell Davis 369 times. The reigning league MVP was a running back, Barry Sanders, who was also for a brief period of time the league's highest-paid player. In a world before the current one that has Peyton featured in an ad during every commercial break, endorsements helped Emmitt Smith earn more money than any other football player. Manning would be part of a league in which that changed. The easiest way to measure that, very simply, is by how frequently teams chose to throw the football. During 1998, Manning's rookie season with the Indianapolis Colts, the average team threw the ball on 55.1 percent of its offensive snaps. With Manning struggling on a bad Indianapolis team, the Colts threw the ball in part to try to survive, passing on 60.9 percent of their offensive snaps. That was the third-highest rate in the league. In 2015, the average team was up to a pass frequency of 59.0 percent. That would have been the sixth-highest rate in football in 1998. Perhaps a better measure of how the Colts wanted to throw the ball was what they did on first-and-10. The average team threw the ball 46.7 percent of the time on first down in 1998, despite the fact that teams were averaging 4.1 yards on the ground and 7.2 yards in the air. Manning's Colts were far more pass-friendly -- they threw the ball 49.5 percent of the time on first-and-10, the ninth-highest rate in the league. In 2015, the NFL as a whole threw the ball a virtually identical 49.7 percent of the time on first down. It's not just how frequently teams throw the football in 2015; it's where those throws come from too, which speaks to Manning's influence. More and more, the shotgun has become an irreplaceable component of NFL offenses. That wasn't the case in 1998. Under offensive coordinator Tom Moore, Manning became one of the first (if not the first) quarterbacks in league history to work out of the shotgun as his base offense. That would have been heretical in 1998. According to play-by-play data compiled by Football Outsiders, the average team put its quarterback into the shotgun on 9.4 percent of plays that year. Eight teams didn't even use the shotgun once all season. The Colts weren't as shotgun-intensive as they would later become, but even during that rookie season, Manning lined up there 22.7 percent of the time, which was the fifth-highest rate in the league. The Steelers, who had Kordell Stewart at quarterback, used the shotgun a league-high 26.6 percent of the time. And that, in turn, would be equally heretical in 2015. The league's least-friendly shotgun team was the Arizona Cardinals, and they dropped Carson Palmer into the shotgun 38.1 percent of the time this season. The NFL as a whole took 61.7 percent of snaps in either the shotgun or pistol formation (the latter of which didn't even exist in 1998) during the 2015 campaign, with Chip Kelly's Eagles taking just 7.5 percent of their snaps from under center all season. DeMarco Murray can tell you about that. There are all kinds of reasons why teams moved their quarterbacks out from under center, but the most obvious arguments against the change, that a team wouldn't be able to run its offense out of the shotgun, were laughed away by the runaway success of Manning, Moore and the Colts. The move to more passing plays and a more efficient offensive scheme also has changed the baseline for an excellent season by a quarterback -- at least in terms of raw totals. The big round number for running backs used to be 1,000 yards. That's no longer the case. Likewise, with quarterbacks, the marker for success has risen. Now, the simple round measure of what represents a productive season for a quarterback is 4,000 yards. Twelve passers hit the 4,000-yard mark this season. In 1998, just two quarterbacks made it to 4,000 yards, Brett Favre and Steve Young. Manning didn't hit the 4,000-yard mark that year, coming up 261 yards short, but he would top the figure in each of his next six seasons. If anybody established 4,000 yards as the simple baseline, it was Peyton. He has posted a whopping 14 4,000-yard seasons over the course of his career. Drew Brees has put up 10, and nobody else in league history is in double digits. That production also has come with a reduction in sacks. Albeit on different teams, Manning was in some ways the natural NFL replacement to Dan Marino, who posted a freakishly low 3.13 percent sack rate during his career. That includes a career-opening run in which Marino posted the league's lowest sack rate in seven consecutive seasons. Marino seemed like a freak ... until Manning came along. Despite playing behind some janky offensive lines, Manning carried on Marino's legacy as a quarterback who simply didn't take hits. With one of the worst offensive lines in football trying to protect him this season, Manning's sack rate spiked, but it took him to a place of relative poetry. He, too, has a 3.13 percent sack rate, during an era when quarterbacks are taking fewer sacks than ever before. That has unquestionably helped keep Manning upright and playing late into his career, but more on that later. Those Colts scattered to the winds years ago. The last active player on Indianapolis' roster in 1998 to suit up in a regular-season game was defensive end Bertrand Berry, and that came all the way back in December 2009. Manning has been the last player left from that Indianapolis roster in the league for six full seasons now. Most of the players on that team failed to last in the league for six years. The last offensive player on the roster besides Manning to stick around was Marvin Harrison, who retired after the 2008 season. The same is true of Manning's draft class. 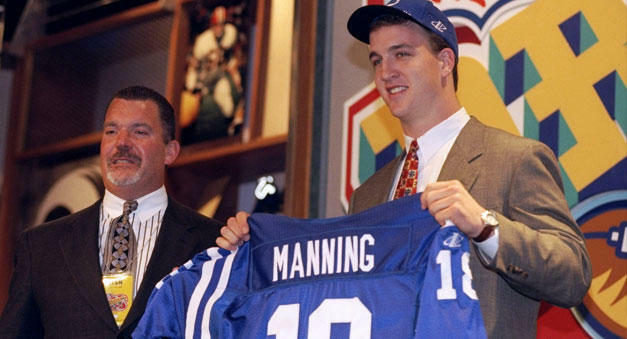 As the first overall selection in the 1998 NFL draft, Manning was expected by most to be a star. (Others found Ryan Leaf more appealing.) Nobody, regardless of how much faith they placed in Peyton, could have imagined that he would last this long without breaking down. Only two other players drafted alongside Manning that year were still in the NFL in 2015: Matt Hasselbeck, who was inactive during that rookie year, and Charles Woodson, who retired after the end of the season. Nobody from the subsequent year's class is still in the league. Per the Elias Sports Bureau, of the 1,706 active players in the league during that 1998 season, just three -- Manning, Woodson and Adam Vinatieri -- also suited up for a game in 2015. The players who currently suit up alongside Manning in Denver also were watching from afar. Obviously, nobody on the Denver roster was playing in the league when Peyton entered the professional ranks in 1998. That's selling the age gap short. When Manning turned pro, there wasn't even a single Broncos player who had made it to college yet. Antonio Smith, the team's second-oldest player, was still a junior in high school. Denver's youngest player, cornerback Lorenzo Doss, probably doesn't remember Manning's suit and awkward pose with a curiously groomed Jim Irsay. Doss was probably excited about his upcoming birthday -- he turned 4 years old the week after Manning was drafted. Some of the quarterbacks who will arrive on college football campuses this year as part of the recruiting class of 2016 will be younger than Manning's professional football career. What Manning has done personally since entering the league, of course, is the stuff of legend. First, although he missed all of 2011 after undergoing neck surgery and sat out six games this year, Manning's sheer ability to stay healthy has been remarkable. He began his career by starting 208 consecutive contests, which is 13 seasons in a row without missing a start (or a game) because of injury. Nobody else in league history has done that to start his career. Brother Eli sat behind Kurt Warner for part of his rookie season, but has since completed 11 consecutive seasons without missing a start. With the football in his hands over that time frame, Manning has been close to unstoppable. Even with that missed season and a half, Peyton's numbers since joining the league lap the field. None of the 572 players who have thrown a pass over that time frame is close to Manning's totals. He has thrown for 71,940 yards and 539 touchdowns over that time frame. Brees is second in both categories over that stretch, and while Brees entered the league in 2001, his numbers aren't remotely comparable, as he's more than 10,000 yards (60,903) and 100 passing touchdowns (428, tied with Tom Brady) behind the former Tennessee star. To put Peyton's longevity into context, he has managed to spend enough time under center to accrue some meaningful value as a runner. It may have taken him 431 carries, including a fair number of sneaks, but Manning has run for 667 yards over the course of his career. A full 28 picks after Manning, the Dolphins chose John Avery with their first-round selection in the 1998 draft. Avery ran for 524 yards during his abbreviated NFL career. Avery was one of three first-round picks at running back selected during Manning's career who failed to match Peyton's career rushing totals. Manning's value hasn't come solely because of his ability to stay on the field and accumulate numbers; his peaks have been higher than anybody else's in football, too. We don't have QBR for the earlier days in Manning's career, but as a useful performance-in-a-single-number statistic, pro-football-reference.com has adjusted net yards per attempt (ANY/A), which does a better job than passer rating of weighting the value of touchdowns and interceptions and includes sack yardage. By ANY/A, Manning's peak seasons were out of this world. His 2004 campaign rates as the best single-season performance in league history. Manning passed for 4,557 yards on 497 attempts, threw 49 touchdowns against just 10 interceptions, and took a staggeringly low 13 sacks. He averaged 9.78 ANY/A per dropback, which is awfully difficult to stop. Aaron Rodgers' 2011 season is the only other campaign above 9 ANY/A. Peyton was also at the helm of the 2013 Broncos offense, which rated out as the best offense in football history, even after adjusting for the higher point totals of the modern game. He averaged 8.87 ANY/A that year, which is the fifth-best season in league history. If this is really Manning's last season, he'll finish his career having produced five of the 25 best passing seasons in the history of the NFL by ANY/A (minimum: 400 pass attempts). Nobody else has done that even four times, and the only other guy in league history to execute it three times is Manning's rival, Tom Brady. Manning's rivalry with Brady became the flashpoint for endlessly insipid arguments about whether one of the quarterbacks was more of a winner than the other. Looking back, while Brady ended up winning more titles than Manning and holds an 11-6 record over his nemesis, he didn't dramatically outplay Manning in their games together. After adjusting for the quality of each team's defense, Chase Stuart notes that the numbers suggest that the two are essentially in a dead heat. And while Brady developed a reputation as the quarterback who could beat Manning when the games really mattered, Denver's win over New England in this season's AFC Championship Game means that Manning (if he retires) will actually finish his career with a winning record over Brady in the playoffs at 3-2. Quietly more impressive -- and a sign of just how stupid the idea that Manning somehow wasn't a winner truly was -- is what Peyton did in the close games for his teams. History suggests that the vast majority of teams exhibit no consistent ability to win a significantly high percentage of their close games from year to year. The same is true for quarterbacks. The most prominent arguments against that logic, Andrew Luck's remarkable short-sample run aside, are Brady and Manning. In games started by Manning, the Colts and Broncos have gone a combined 76-39 (.661) in games decided by seven or fewer points. If it's true that the typical quarterback will win about 50 percent of his close games in a given year, that amounts to 18.5 extra wins from Manning over the course of his career, or a little over one win per season. And that doesn't include Manning's two close wins in the playoffs this season. The only quarterback since the merger to start 50 one-score games or more and post a higher winning percentage is Brady, who has gone 62-26 (.705) in those same contests. Third is Jay Schroeder (.654), because football is weird sometimes. Of course, all that has passed and everything Peyton Manning has accomplished is of absolutely no consequence in predicting what will happen this Sunday in Super Bowl 50. The Panthers and their minus-18.4 percent DVOA represent the toughest defense he has faced in the playoffs since Super Bowl XLVIII, when the Seahawks (who posted a minus-25.9 percent DVOA) made Manning miserable in a disastrous performance. You'd be tempted to wonder whether Manning can handle those sorts of dominant defenses until you remember that he faced a similarly great Jets defense in 2009 (minus-25.5 percent DVOA) and was spectacular, throwing for 377 yards and three touchdowns against a pass defense that hadn't allowed a 300-yard game all season. The thing about late-career Peyton, though, is that he's full of surprises. Nobody expected him to sit out the 2011 season until it actually happened. Nobody expected Manning to follow a slow start to his Broncos career with another mini peak, including one of the best seasons of quarterback play in league history at the ripe old age of 37. Nobody expected him to fall off the cliff so quickly, having struggled toward the end of 2014 before collapsing during an ugly first half this season. Nobody expected Manning to come back in Week 17 and lead the Broncos to a victory. And more than anything, nobody expected Manning to help guide Denver to the Super Bowl with wins over Brady and Ben Roethlisberger. And now, given how dominant the Carolina defense has looked this postseason and how wonderful Cam Newton has been at quarterback, nobody expects Manning to pull off one last hurrah and ride off into the sunset with his second Super Bowl ring. But all the way back in 1998, nobody in their right mind would have also expected Peyton Manning to be playing quarterback in 2015. So why should we suddenly take that outcome for granted now?